Slow Cooker Sweet & Sour Meatballs – these tasty, tangy and sweet, little meatballs are so easy to make and keep warm in the slow cooker, perfect for a game day get together, potluck or party anytime. I love that these meatballs are made in the slow cooker. All the prep work is done earlier in the day and when your guests arrive, the meatballs are ready to go. You can then keep them warm and even serve then straight from the slow cooker, allowing guests to help themselves, so easy! 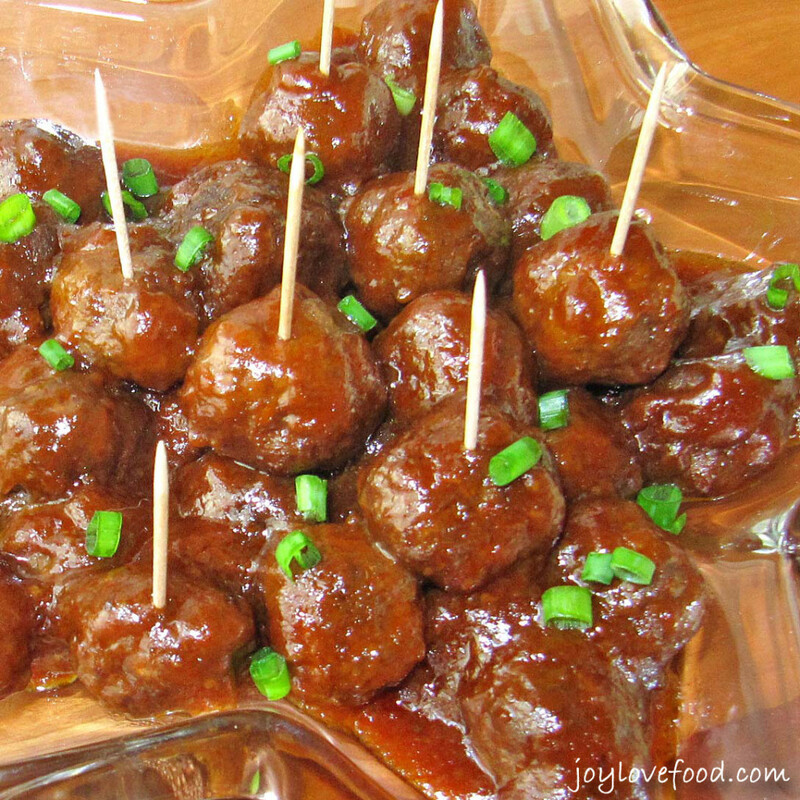 I came across the original version of this Slow Cooker Sweet & Sour Meatballs recipe years ago when I did an Internet search for a slow cooker meatball appetizer recipe. I was skeptical about making them at first because of the main ingredients, which are grape jelly and chili sauce. But, it was a popular recipe, so I gave it a try, and am so glad that I did. These little meatballs are so good, sweet and savory, tangy and super delicious. Who knew such a combination would be so good? These little Slow Cooker Sweet & Sour Meatballs are a great dish to take to a potluck, and are also a wonderful addition to a brunch buffet. When I do a brunch buffet, I often like to have a mixture of sweet and savory breakfast items, along with some tasty snack and appetizer items, such as these little meatballs. I often like to have a brunch party, for family and friends, for my son’s January birthday and these meatballs are always one of the most popular items and one of the first to be finished. These delicious Slow Cooker Sweet & Sour Meatballs, are so easy to make and keep warm in the slow cooker, perfect for a game day get together or party anytime. Do you have a favorite slow cooker meatball recipe? Please let me know in the comments below! Slow Cooker Sweet & Sour Meatballs - these tasty, tangy and sweet, little meatballs are so easy to make and keep warm in the slow cooker, perfect for a game day get together, potluck or party anytime. In a large mixing bowl, combine ground beef, bread crumbs, milk, salt and pepper. Shape mixture into 1 inch balls. In a 5-6 quart slow cooker, whisk together grape jelly, chili sauce and lemon juice. Cover slow cooker and cook on high for 4-5 hours or until meatballs are cooked through. In a small bowl, create a slurry, by whisking together cornstarch and water, until cornstarch is dissolved. Add slurry to sauce in slow cooker, stir until slurry is incorporated into the sauce. Replace cover on slow cooker and continue to cook on high for 30 minutes or until sauce is thickened. 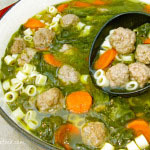 This entry was posted in Appetizers & Small Bites, Crock Pot / Slow Cooker, Main Dishes and tagged appetizer, crock pot, easy, game day, make ahead, meatball, meatballs, party, potluck, quick, recipe, slow cooker, sweet and sour. Thanks so much for stopping by!! Looks like a great recipe!! Debbie-Dabble recently posted…January Rudolph Day!!! Just a Bit of Snow!!! 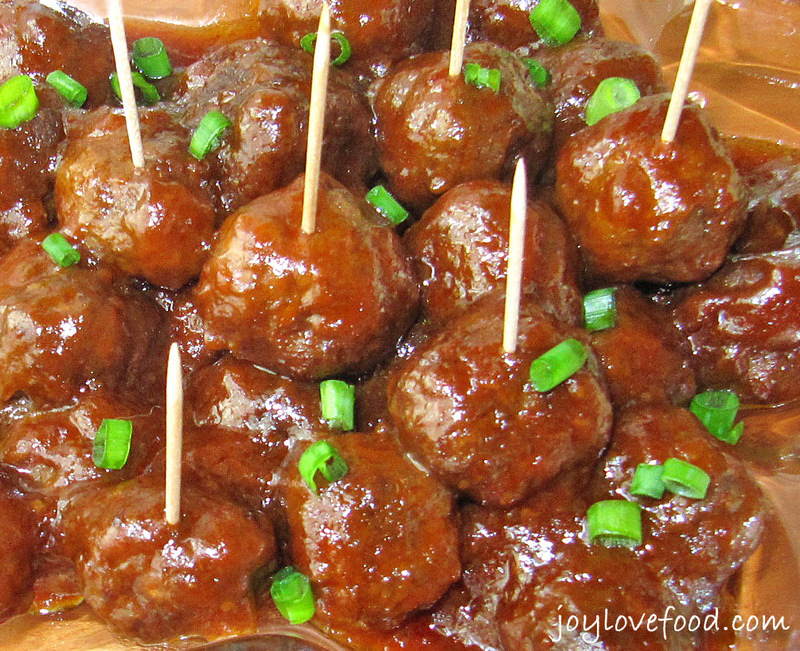 These meatballs look delicious, Joy.I love that they are made in the slow cooker, too. Pinned and Tweeted. Thanks for partying with us at Snickerdoodle Sunday each week! Joy your super bowl party must have been perfect! First the cheese dip and then these yummy meatballs! I think I’m in heaven! Thanks for sharing on My 2 Favorite Things on Thursday – Link Party! I hope to see you again tomorrow! Pinned! Elaine recently posted…Tid Bit Tuesday – Fat Tuesday! Your Meatballs look awesome! Thank you so much for sharing with us for our 5th Anniversary of Full Plate Thursday! Hope you have a fantastic week and hope to see you again real soon! Your meatballs sound delicious. Thank you for linking up at the LET’S GET REAL WEEKLY LINK PARTY. I love my crockpot and this meatball recipe is to die for. I can’t wait to try it. Thanks Rebecca! Hope you give it a try and enjoy! These look wonderful. I’m with Michelle, thinking Superbowl. Thanks Linda! These would be perfect for game day! My son has a January b-day too. January birthdays are kinda hard coming off of holiday festivities. Using the crockpot to help is a must. I’ve never made these little meatballs–they look good! I’m thinking Super Bowl! Hi Michelle, these would be great for game day! Thanks Cyndee! Thanks so much for sharing! I bet these will be perfect for the saucy appetizer at our superbowl party. Pinning! These look so yummy to me! Thanks so much for linking up at the Totally Terrific Tuesday Link Party. I hope you stop by again tonight at 10pm to show us what you’ve been up to this week. It’s so much fun partying with you! Thanks Christie! I will definitely be back at Totally Terrific Tuesday! how funny, i do this the lil smokies.. by this i mean the grape jelly and chili sauce. People always comment on how odd it is. I like the idea of the meatballs, though, because I love me some meatballs! Thanks Kristen! I will definitely be back at #HomeMattersParty! 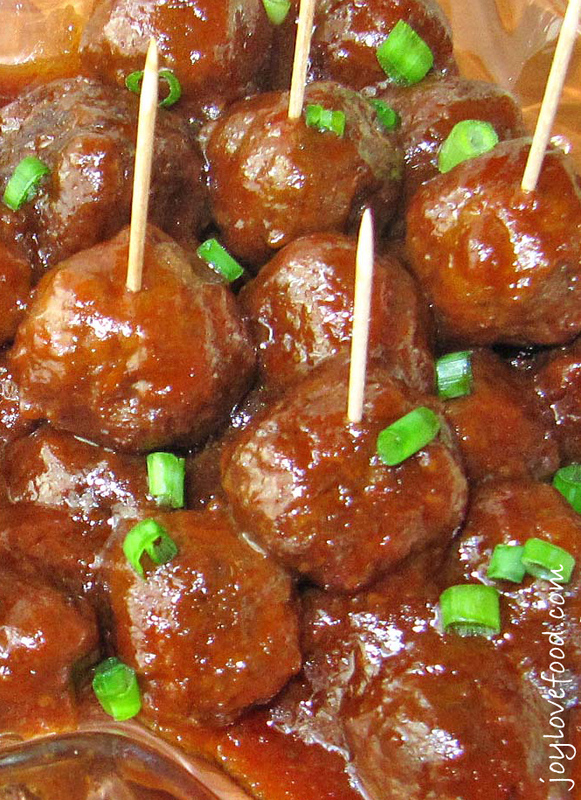 Lunch, dinner, party appetizer…I can think of tons of different ways to use those yummy meatballs! Thanks so much for sharing them with us at Foodie Fridays! Pinning and sharing! Thanks Michelle! You are right, these meatballs are so versatile! These look so yummy! Right now, my crockpot is glue to my counter to I am going to have to try this out! Thanks for sharing. These sound so good -something my husband would love (and me). Have a great day! Thanks Vickie! 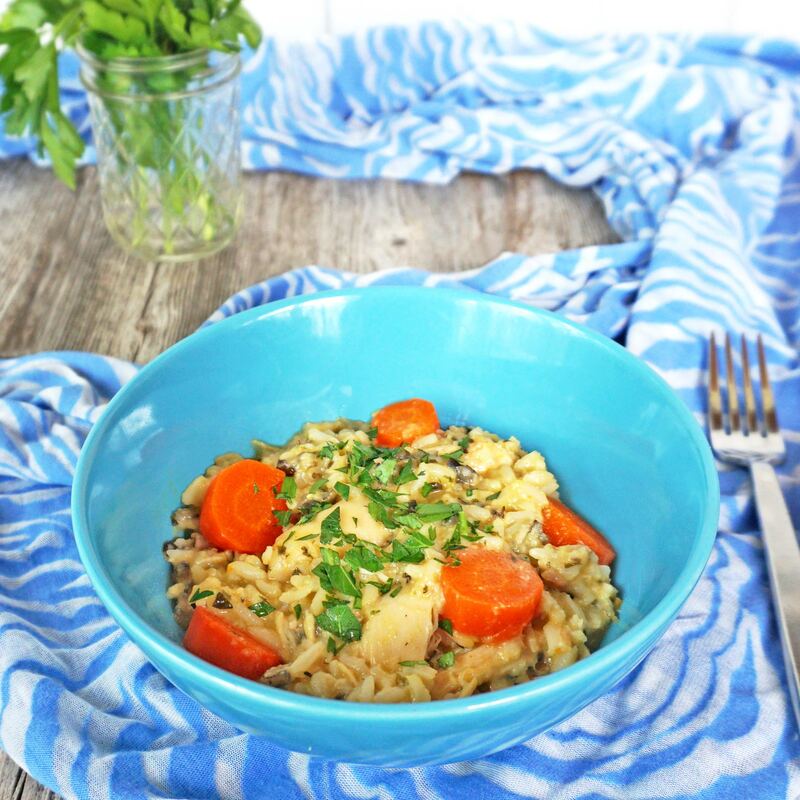 Hope you give it a try and enjoy, it is so easy and delicious! Thanks Nicole, I’ve linked up! I have a recipe using cut up hot dogs with grape jelly in the slow cooker that tastes amazing, so I’m guessing that this recipe is equally as good. Who would ever think that grape jelly would make such a good ingredient in appetizers!?!?! 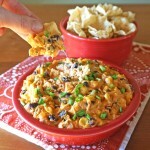 These sound perfect for a party and I love anything that can be done in a crock pot! I agree about the grape jelly, I never would have thought to use it with meatballs, but it really works, they are so good! Your hot dogs sound good too. These are such a great idea for feeding a crowd! I’m sure they are a big hit! Thanks for sharing this great recipe! 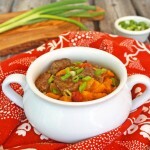 They look super yummy and anything in a crockpot is good! These look great and I am willing to try this. I do savory meatballs already but adding only jelly & bbq sauce! It tastes great but I am up for new ways!!! These little morsels look wonderful!!! Oh my goodness! Those look so delish! I have no choice but to make them for the Super Bowl now. Thanks for sharing the recipe this week. Thanks Merlinda! I hope you give this a try, it is so good! I’m pinning this to my “Game Day” board – the guys will love these! Thanks Jen, thanks for the pin! Love the sweet and sour sauce! Never would have thought to use grape jelly! Thanks Rebecca! I agree about the grape jelly, who would have thought? !